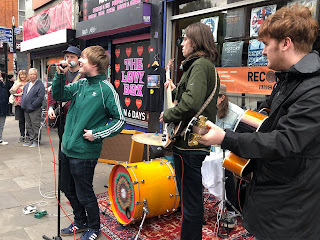 There's a confident swagger to Dirty Laces, something that sets them apart from let's face it the overdose of four / five-piece lads bands that seem to be everywhere you look in Manchester. Charlie's got a swagger about him that feels natural rather than forced, you see him living the songs as he sings them rather than worrying about whether he looks real enough. This is obviously an unusual setting, stood outside Vinyl Revival to support Record Store Day with the sound of an industrial drill in the background, irate drivers beeping their horns as the crowd, including Tim Burgess of The Charlatans who stops to listen to a couple of songs en route to his Piccadilly Records DJ set, have spilled over into the road adding to Manchester's endless traffic chaos. It's moments like this though where you see whether a band has something or not. The answer to that is an unequivocal yes. Naysayers might point to a love of Oasis like it's an incurable tropical disease, but taking influences and making them your own without merely copying is far from a crime particularly if you do it as assuredly as Dirty Laces do even out in the street. We only get five songs and we don't catch the names of all of them because of the drill and the horns and the near collisions that are happening just feet away from us in the road, but they opened with recent single Moving Pictures, added in its b-side Lose Control and concluded with early single Set In Stone from their debut EP that's neatly behind them in the shop window. Given the cobbled together nature of the set up, with Charlie telling drummer Luke to put the towel back on his kit to prevent him drowning everyone out and attracting unwanted attention from the neighbours, it's a success as the queue to buy singles and t-shirts at the end demonstrated. Dirty Laces are on Facebook and Twitter. 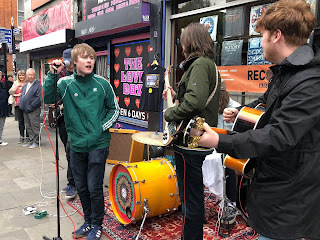 They play Halifax Loafers (April 21), Hyde Pop (27, under 18 show), Liverpool Sound City (May 4), Carlisle The Source (17), Failsworth The Loose Cannon (31) and Manchester Jimmy's (July 9).